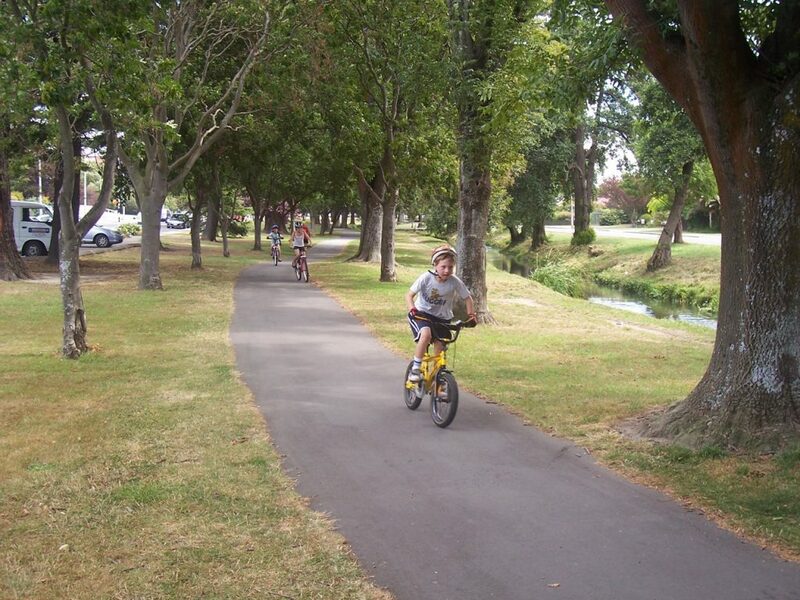 Christchurch might be better known for its Avon River (which is quite a nice place to ride too) but if you’re looking for a gentler and more scenic cycling route, I would recommend trying out a section of the Heathcote River. From Cashmere out to Ferrymead via Beckenham, Opawa and Woolston is over 13km, but the good news is that you can dip in and out wherever you like, taking short stretches as you see fit. 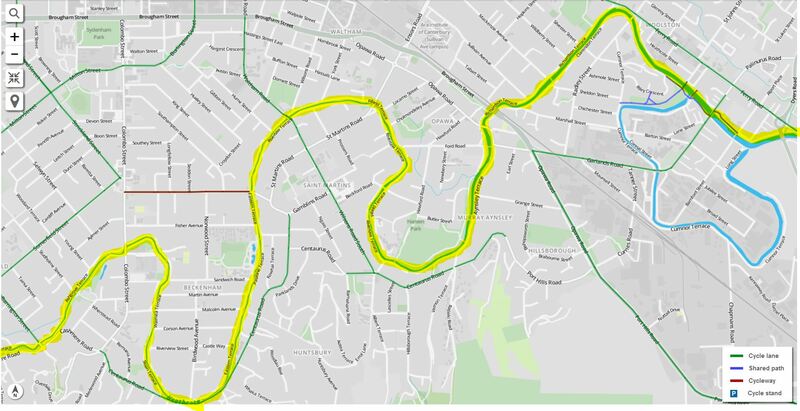 Most of the Heathcote River corridor features either pathways or quiet streets along the river banks; short sections of Centaurus Rd near Bowenvale and Ferry Rd near Woolston are probably the only bits where traffic gets quite busy (and even there you could elect to use the footpath or the cycle lane). And with largely gentle routes on both sides, you can get a different perspective each way by doing a “loop” up one side and down the other. For kids learning to ride, there are a number of good sections of sealed off-road route to get some practice in. Key sections include Cashmere next to Princess Margaret Hospital, Hansen Park in Opawa, and Radley Park near the Woolston cut. If they get a bit sick of biking, there are some good playgrounds too for burning off extra energy! For those who prefer a bit of quiet bush trail, you can whet your appetite with Ernle Clark Reserve (Cashmere), south of Malcolm Ave in Thorrington, and behind The Brickworks in Bowenvale. The lower reaches of the Heathcote just before it reaches the Ferrymead mouth also provide some scenic gravel trails, although be careful with some of the corners and loose surfaces. For those interested in a bit of history, there are a number of display boards along the way pointing out some of the heritage of the river, especially when it used to be a major commercial waterway. It’s pretty easy to navigate along the Heathcote; you just keep the river in sight as you go along. Some roads might state “NO EXIT” but rest assured there will always be a pathway connection to continue the journey on bike. There is just one bit of riverbank opposite Hansen Park (King George V Reserve) that, for some historical quirk, does not allow cycling (although you can always just wheel your bikes past the houses that front it). Once you get below the Bamford St footbridge along the Woolston Cut, you will have to stick to the true left (north) side of the river to take you out to the estuary. For longer rides, the trickiest bit is probably getting across some of the main roads that bisect the river, including Barrington St, Colombo St, Wilsons Rd, Ensors Rd, Radley St and Rutherford St. Fortunately most of them have a median island to help you split the crossing at busier times, but you do still have to pay attention. 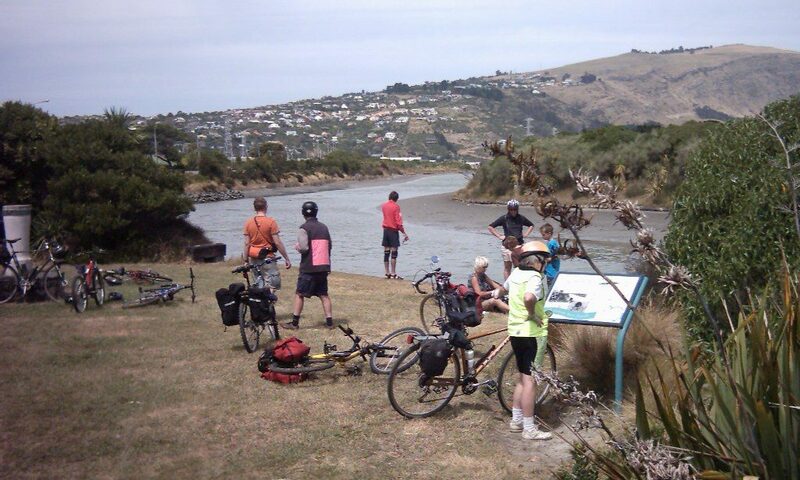 On reaching the Heathcote mouth at Ferrymead, you have the option of continuing east along the Coastal Pathway, or in a few months heading back towards town via the next stage of the Rapanui major cycle route. In a few years, the Heathcote River corridor will get even better, with the development of the Ōpāwaho River Route Major Cycleway along here. 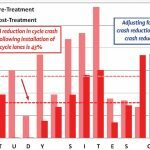 This should see widened paths, slower street speeds, and safer crossings of the busier roads along the way. I can’t wait! Have you ridden along the Heathcote River corridor? Next Next post: Can you overtake a bike now on Dyers Pass Rd?